In light of tragedies around the world I opted to make this card about Love. In my meager way I extend condolences and sympathies to all family and friends of anyone killed or hurt in war or senseless killing. Take advantage of small moments when they come your way and be ready at all times to meet whatever maker you believe in. So much for my soap box. I've used all Stampin' Up products here except for the embroidery floss and the Souffle pen to do the tiny hearts on the sentiment. There are some interesting entries and Design Team takes on this particular sketch, so click on the link above and check out some more creative ideas. Sweet card Beverly. I really like those doily dies! They are lovely! Thanks for joining us this week at Freshly Made Sketches! 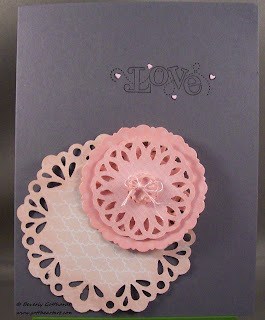 What a great card Beverley ... love those doilies and I love the teeny tiny hearts ... great job! Love the pink and grey and your layered doilies. Thanks for playing with us at Freshly Made Sketches. Lovely card Beverly! Thanks for playing with us this week at Freshly Made Sketches!